This definitely not valid. Sorry. Maybe the reason RY has problems with his feet is because he keeps shooting himself there. What are you trying to show me with that link? I don't see anything relevant to this topic... what did I miss? Can someone make one of those map graphics for the Lebo section? The TomTom screen shots show a 35.18 mile run starting at 22:10 and lasting 5:27:42 (so ending 3:38). Using the tracker to estimate start and stop points for this run, Rob started near road E just west of Emporia, and ended just west of Iris road a few miles west of Lebo. Google maps shows this as approximately 26 miles. That means the TomTom should show about 26 miles for that segment. It shows 35 miles because the RV had to backtrack approximately 6 miles (adding a total of 12 to the distance), so if the TomTom was on the RV, it would travel approximately 38 miles. Give a little margin for error because the tracker only goes every 12 minutes, and we are pretty close to the 35 miles on the GPS, and a lot closer than Rob would have been if he were wearing the watch. This stuff has been mentioned before, but it would be nice to have a graphic on it. Combining the TomTom screenshot, RV Tracker, lack of Strava data, eye witness account, and video footage for this section of the run, it seems like the case for Rob cheating the Lebo section is pretty incriminating. Quick observation -- looks like the dummys finally figured out that the strava segments didn't match the TomTom MySports screenshots they posted awhile back and removed the whole set of screenshots from the MarathonManUK Facebook page. 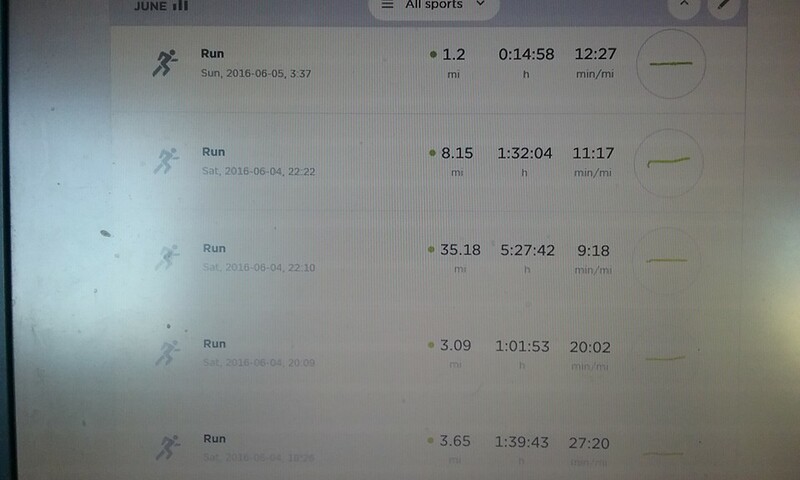 TomTom MySports screenshot: http://i.imgur.com/R2K383f.jpg (Times are EST) - 35.18 miles starting at 22:10 EST, taking 5:27:42. Strava segment: https://www.strava.com/activities/617473068 (cropped t20 minutes at the beginning and cropped 3 hrs, 55 minutes at the end, chopping off the Lebo part. Altering Strava segments is a MANUAL process. They did not have the sophistication probably to alter the GPX files before uploading them to strava. They downloaded them as GPX from the TomTom website one at a time, then as they uploaded them, had to take the effort on all of the mismatched segments to open up a special page in strava and drag a slider bar from the beginning or the end of a segment or the end of a segment in order to modify these. Very much a manual process. What do you think the 22:22 8-miler corresponds to? I'm still not completely understanding the significance for this part? Can't he just claim he left the watch on in the RV when he swapped it out for the other one? Happened when the RV broke down too - he left one watch running. I don't think there is cropping at the beginning. They are 2 minutes off, but TomTom starts later. Cropping the Strava activity would make that one start later. And I think we established the TomTom site doesn't have that functionality so I don't think he cropped it there. I've noticed a consistent time bias when comparing some of these. I think one of his watches was off by 2 minutes, one by 6-7 minutes. And sometimes on London time. I see what you are saying. I was thinking the 8-miler is his actual run/walk through Emporia while the 35-miler is data from the RV. If they are happening concurrently, he can't claim that 35 miler as him running. I guess he could just say the gps was left on in the RV, but it wasn't him running, so he decided not to upload it. In that case we are still just left with a lack of gps data for the Lebo area. It is curious why the TomTom shows 8.15 miles but the strava run only shows 6.6 miles. I'm still working on matching the TomTom data with the tracker in case there is any valuable information there, and I might add strava data after that so it is all in one spot. The timing for the first part of that 6.6mi would put him at Sunnyslope about 8 - 9 minutes after the RV would have passed through, so that supports him being the guy in the video. It is mind blowing to me that the RV driver completely lost him for a good 6 miles and had to be called back to find him?! Did they forget that he wasn't in the RV? Did the driver at the time seriously think he could run 6 minute miles for that long? He manages two 6:00s and then a pair of 8:00s before having to walk... The problem they have here is that after the RV comes back to him, they jump right back out there at 6:00 flat pace again for another 20 miles. So apparently that bar sold him some good recovery juice. Look at the 3-miler that happens 20:09 according to TomTom. It's on Strava as 2:09PM. 6 hours difference. So the 8.15 miler at 22:22 might have actually been at 4:22 PM? Check what the tracker was doing but I think supposedly resting at that time? And he already has uploads to cover everything from Cottonwood Falls through Emporia: http://ryinvestigation.blogspo...-data.html (zoom in). Very confused. Just a totally errant activity there, may not mean anything. Would be nice to also tag each of these with media where they exists. Feel free to go to the fake RY page (https://www.strava.com/activities/619872609) and add comments with imgur links, etc, for videos, photos, analysis, letsrun links, graphs, etc., that would be associated with these segments. ok, some unproductive time at work produced some analysis of one of Rob's strava segments. 25.5 mile run at 5:40 pace outside of Alamosa CO.
That is more than negated by the fact that the run averages about 8000ft altitude. I compared it with tracker data. It matches perfectly. Confirms that Rob was with (or inside) the RV throughout the run, and he took one 15min break at 13.7 miles. The other 6 minutes between running and elapsed were at the end of the run. I'm calling bs on that strava segment. A 3.22 k split in there (16.50 5k pace when Rob's PR is 17.31 from the 2015 London Marathon desperately trying to keep up with Paula) preceded by a 3.36 and a 3.41. No way could he have run those splits. Well yeah it's expected. But if the RV tracker doesn't line up with the gps then Rob can't be in the RV. Just wasting some time at work. I know it doesn't mean much. True - or there's a bike or something else generating the recording. It's good to check I guess, good job. It'd be cool to have a Strava Fly-By view of the whole journey - GPS files vs. RV tracker. Confirms that Rob is just a really gifted runner that can push a pace close to his marathon PB anytime anywhere, and he's so good he even took one 15min break at 13.7 miles. What did he run the day before and after? Such Horse Patooie. Here's what will help the investigators: clear and objective evidence of the cover up. On June 27 there were 30 photos; now there are 20. The missing 10 are attached, and here's one sentence each on how they contradict his story / show the strava data is false. I don't have the deleted photos so can't send that email. Does anyone have them? I would be very interested to see what photos rob deleted. It's hard to understand unrealistic paces. It's easy to understand a cover up, particularly when it's black and white. I'd love to hand that to skins on a platter.